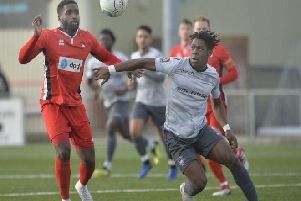 Could Millwall-bound Ransom be ready for last Eastbourne Borough game? Eastbourne Borough welcome Bath City in National South on Saturday, for a match which might just be Harry Ransom’s last in a Borough shirt. Social media has a gift for reporting, or even creating, news before it has happened, and channels were alive in midweek with suggestions that Harry was on the move. They were not far wide of the mark, but ahead of the game. All season, a number of clubs have been tracking the progress of the 19-year-old, and the stakes were raised this month. Ransom spent last week training full-time at Millwall, and last Saturday no fewer than five Football League clubs were represented at Hungerford – where, ironically, the dreadful weather conditions allowed neither side to play any football, and scouts must have gone away none the wiser. But Millwall had seen enough already, and the wheels for a deal were set in motion. Club officials, on both sides, have moved towards agreement, and as the end of the week approached, the paperwork was close to being signed. The terms and transfer fee are undisclosed. Ransom is expected to line up for Borough against Bath City, before becoming a Millwall player. Harry’s qualities, and his potential, are not in doubt, and he surely has a future in the full-time game. He made his debut two years ago under Hugo Langton, in a late-season game at Weston-super-Mare and – brought on as a second-half substitute – he made a strong enough impact to earn Man of the Match from this reporter. Well over six feet but also mobile and two-footed, Harry is the thinking manager’s centre-back. With a supportive family and a measured approach to life, he should successfully make the step up. Meanwhile interim boss Mark McGhee must reckon with life after Ransom, if indeed the Millwall deal has gone to plan. He still has a week or so, until the end of March, before the deadline for new signings, but there will be few new faces. McGhee came into the club with, in his own words, an open mind about the squad of players he inherited. And if they are to prove themselves, it must happen very soon. Encouraging whole-team performances against Hampton and Chelmsford earned battling draws – but the progress was blown away, in every sense, in defeat at Hungerford. McGhee, by all accounts, did not mince words after watching his side surrender in Berkshire, and – two demanding training sessions later – he will look for a drastic response. He might just get it. The weather at Hungerford was not an excuse but it was certainly a factor, and a relatively calm day on the Priory Lane 3G should see Borough playing the coherent football they are capable of. Add to that the likely return of club captain Sergio Torres and lively striker Charlie Walker – both after long-term injuries – and the Sports can deliver a decent result. Visitors Bath City, though, are in formidable form. Unbeaten in five, and third in the National South table, the Romans will be looking for all three points. They are quick, physically strong and unfussy, and they have strikers such as Ross Stearn who can turn a game in an instant. At Twerton Park in the autumn, a single goal – by giant centre-back Robbie Cundy from a corner – was all that separated the two sides. Perhaps, this time, a giant centre-back in a Borough shirt can claim the winner and settle the score. Now, if Harry managed that, he’d be chaired off the Priory Lane pitch.